The iconic development Blackfriars Circus, located in the historic area of Southwark, is nearing completion. 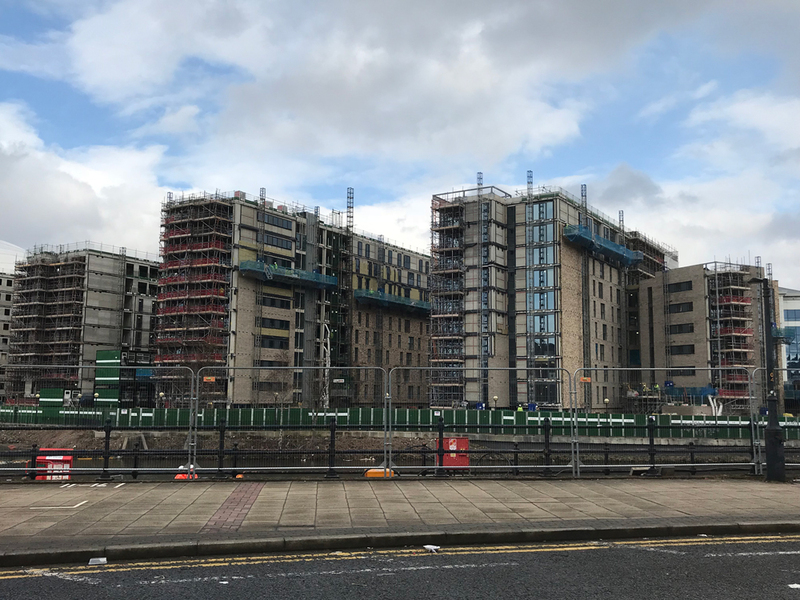 Dearneside has supplied a large Architectural Metalwork package for the scheme including the Juliette balconies, balcony balustrades, feature glazed viewing panels to crown the building and the balustrades and handrails – amounting to £2 million. 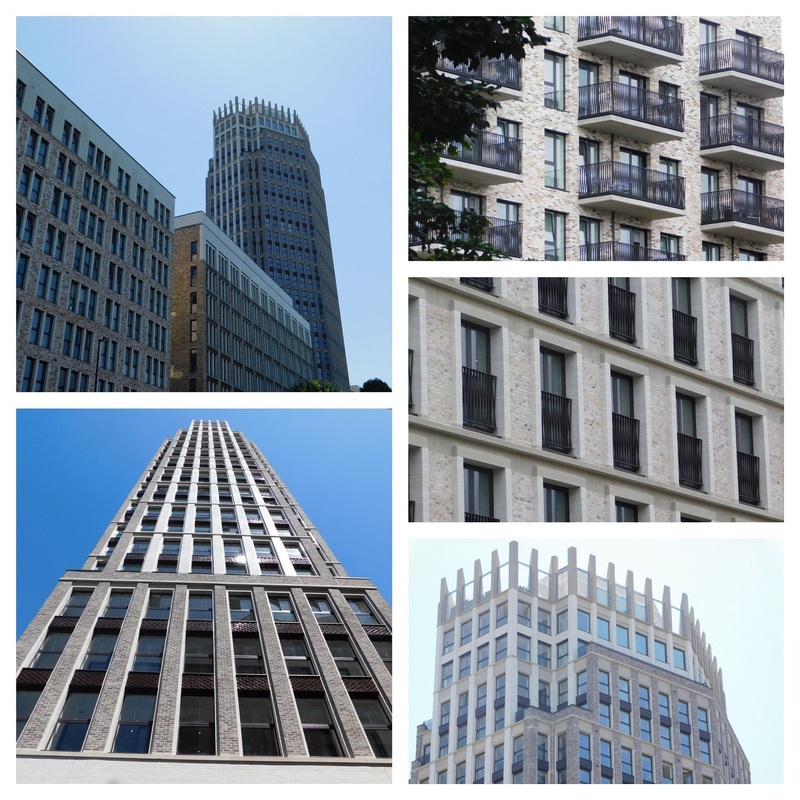 Designed by two of London’s foremost architectural and design teams – Maccreanor Lavington and Witherford, Watson & Mann – and built by leading developers Barrat London, the development comprises of 336 luxury apartments in 5 buildings ranging up to 27 storeys in height. Each apartment includes a private terrace or winter garden with views of the surrounding area. The development also houses a rooftop terrace, landscaped outdoor spaces and around 35,000 sq ft of office space and 16,500 sq ft of retail space. Conquest tower, the tallest building of the development, has become a landmark of the area with its crown-like metalwork structure overlooking Southwark. For more information and photos on the project visit the project page. Dearneside has recently secured Architectural Metalwork for Sir Robert McAlpine on the Exchange Square project in Birmingham. Exchange Square has been described as ‘a new urban village’ in the center of Birmingham, set to be completed by early 2019. Phase one of the development will include over 600 luxury apartments, a members’ club, a gym and a landscaped roof garden. A second phase will see the build of 220 additional apartments. The development will also house over 50,000 sq ft of retail space on the ground floor. Exchange Square is part of the wider £350 million Masshouse regeneration project by Nikal on the site of the old traffic island of the same name. Located adjacent to Birmingham Curzon HS2, the development is ideally placed and reflects Birmingham’s expanding skyline. We look forward to working with Sir Robert McAlpine on this project. 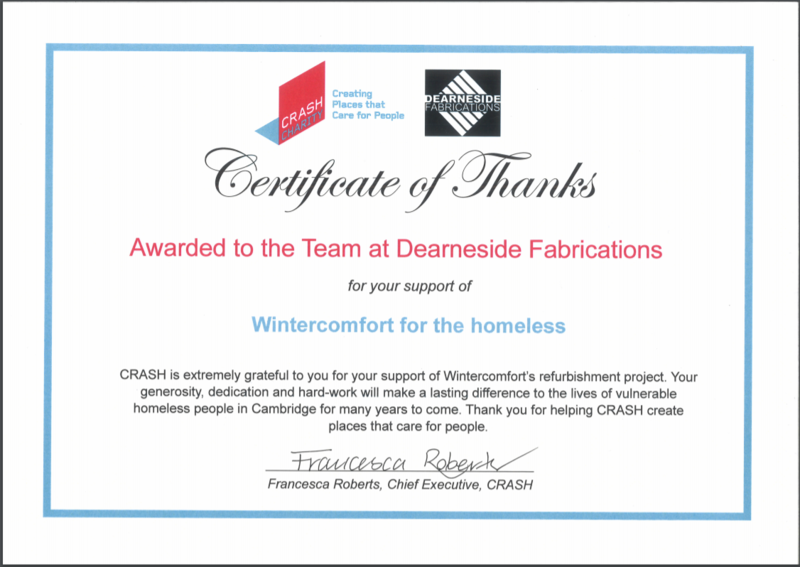 We are proud to have been awarded with a Certificate of Thanks from the charity Crash, for our support of the Wintercomfort refurbishment project, a homeless day center in Cambridge. Dearneside also raises money each Christmas for our local homeless charity HARC in Sheffield. This enables HARC to provide warm shelter and three hot meals a day to the homeless throughout the festive season. Dearneside is very pleased to be nominated for the UK Tekla Awards 2018 for our Oxford Westgate project. Dearneside supplied and fitted the Architectural Metalwork Balustrade throughout the shopping center last year, for Laing O’Rourke. The public vote is now open so if you could please vote for us we would really appreciate it! 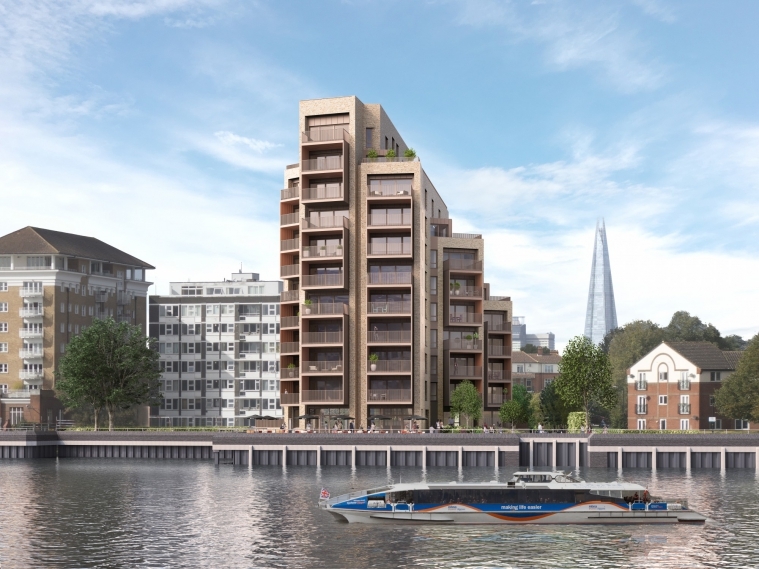 This week, Dearneside has secured the balconies and Architectural Metalwork on the New Pier Wharf development with Hollybrook Homes in London. The development, which is one of the last remaining riverside sites in London, is located at Odessa Wharf in Rotherhithe, at the edge of London’s financial district. Once finished it will consist of 50 luxury apartments with balconies, most of which will face the Thames river. This project will be our first with Hollybrook and will be a great addition to our ever-expanding portfolio of prestigious projects located on the banks of the Thames. 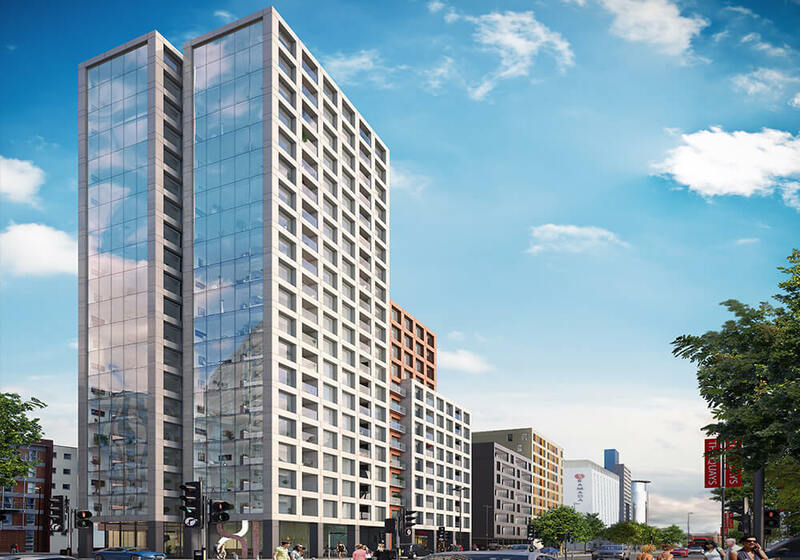 Dearneside is excited to have recently secured the balcony package on the Gore Street project in Salford, a 22-storey PRS scheme being built by Sir Robert McAlpine and financed by Grainger. This will be Dearneside’s first project with construction company Sir Robert McAlpine. 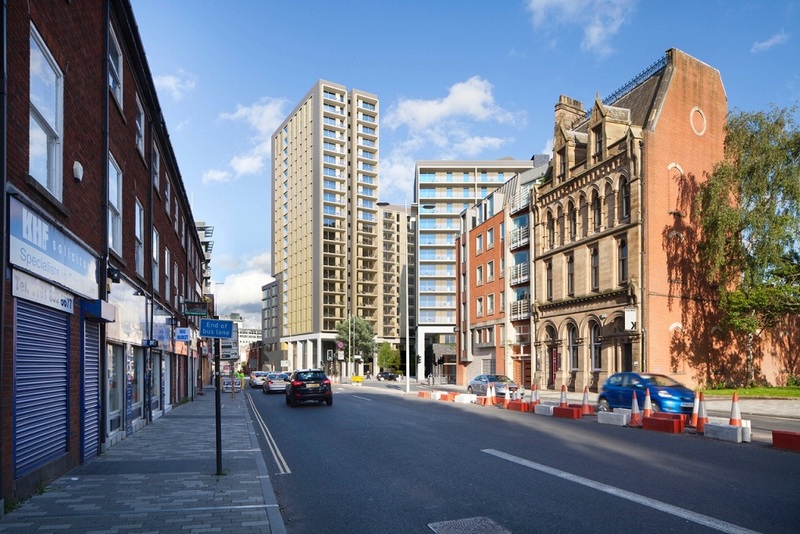 The £80m development is part of the ongoing regeneration plan to transform the Salford’s Chapel Street area. The development is set to be completed in 2020 and once finished, will comprise of 375 private rental homes through a mix of apartments and townhouses. The Manchester area is seeing a boom in PRS projects recently, including the Clippers Quay in Salford, another project Dearneside is currently working on. Dearneside has recently secured the architectural metalwork package on The Gateway project, a new PRS scheme in Salford, Manchester. This will be our first contract with Forrest Construction. The Gateway project is a £21.1 million new build private rented sector (PRS) scheme. 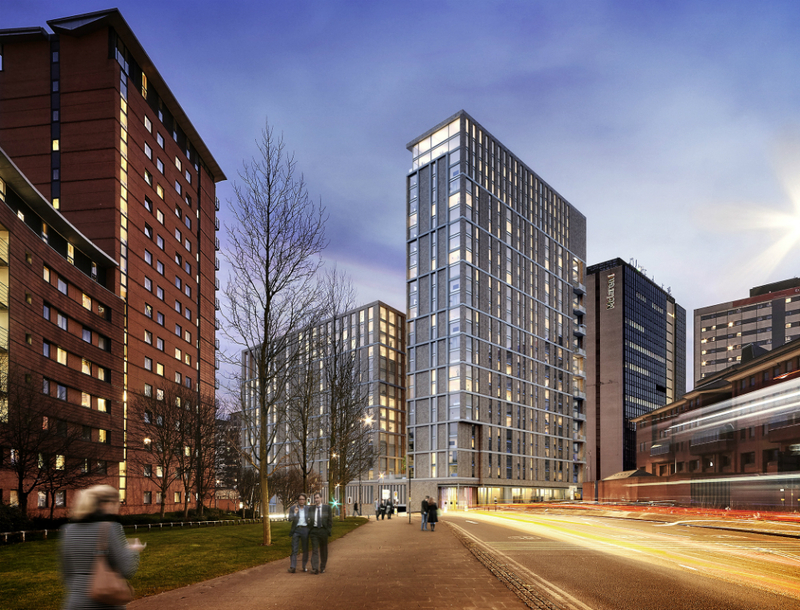 The development will consist of a 19-storey tower in Salford Quays in Manchester. The tower will house 191 premium one-bedroom and two-bedroom apartments, overlooking the city and quays. The development will be finished to the highest standards, with 2.4m high windows to all apartments. The development will also include a double-height gym, car park, secure bicycle storage, a management office and shops located on the ground floor. The developer of the scheme is X1 Developments, a leading development company which focuses on rental accommodation in the North of England. Forrest Construction was appointed to deliver the project, and Dearneside to make and install the architectural metalwork package for the project. Dearneside is currently onsite fitting the Halo steelwork on the Clippers Quay development in Salford, near Manchester. We will be installing the balconies later this month. Dearneside has been contracted by Sir Robert McAlpine, a leading construction and civil engineering company, to work on this impressive project. The scheme, developed by build-to-rent developer Grainger, went onsite in 2016 and should be completed by autumn 2018. It is at present one of the largest build-to-rent developments in the UK, and the biggest one out of London. The site was previously home to a derelict cinema, which was destroyed to build these new apartment blocks. Clippers Quay was seen as an ideal place to build the development due to its connectivity and proximity to Manchester and MediaCityUK. Once finished, the development will comprise of five medium-rise buildings, constructed in good quality, durable and low-maintenance materials. In total it will be divided into 614 apartments, as well as commercial space on the ground floor, with shops and cafes. The Newfoundland Tower and South Quay Plaza development are currently both under construction in the Canary Wharf area in London. The two will feature Architectural Metalwork by Dearneside Fabrications. 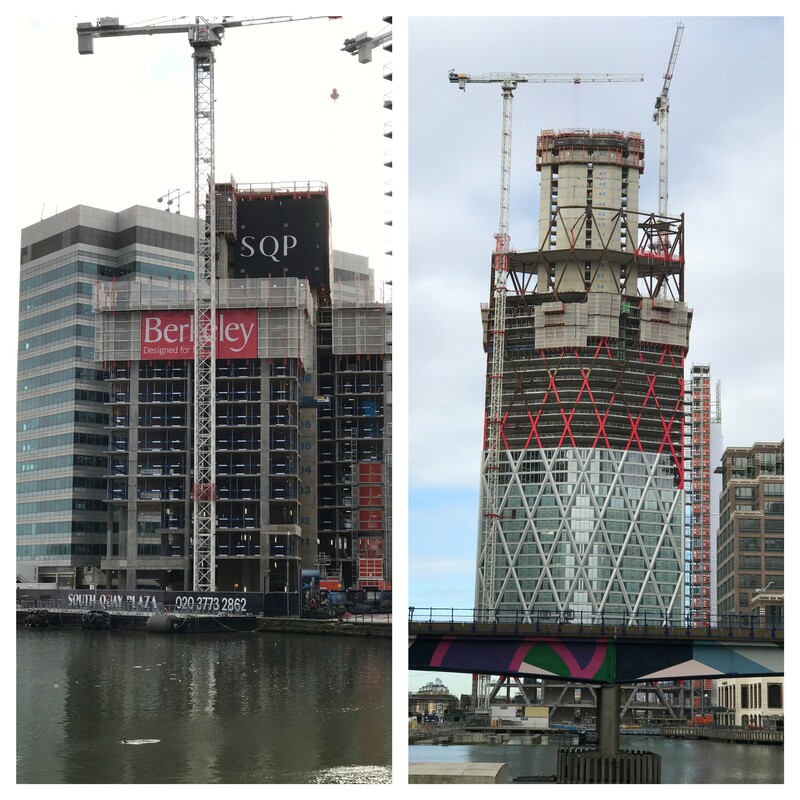 Once completed, these skyscrapers will be amongst the tallest residential buildings in Western Europe. South Quay Plaza, designed by the world-famous architects Foster & Partners and developed by Berkeley, will eventually include three towers, the tallest of which will reach a height of just over 214m making it the second tallest residential skyscraper currently proposed for London. The development will also include shops and facilities, and will sit in 2.6 acres of landscaped gardens. It is due to complete by 2020. Newfoundland Tower has been dubbed the diamond building because of its diamond-like support frame. This type of frame has also been used on other iconic buildings such as the Gherkin. Once finished it will house over 560 apartments and rise to an impressive 60 storeys. The development is due to be completed in 2020.